Baked pumpkin pudding comes out creamy and tastes a lot like pumpkin pie but there is no crust involved. 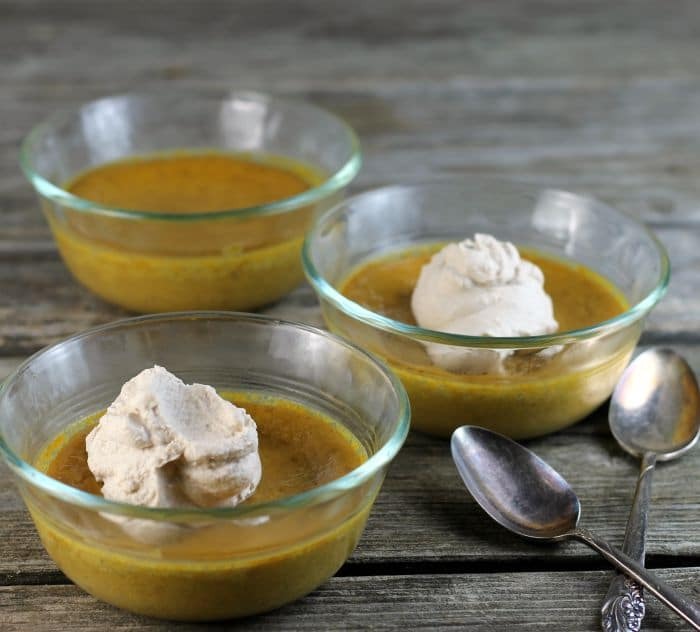 You may want to call it baked pumpkin pie pudding. It’s topped off with a dollop of cinnamon whipped cream. Fall is finally here and I have to say that I am loving it. I would have to say that fall is my favorite time of year. I love the cool crisp air that fall brings and the changes in the colors of the leaves on the trees. The only thing that I would change is how short the days start to get once that autumn comes around. I enjoy a nice evening walk, but by the time I get home from work and have dinner it is already getting dark outside. Well, I guess you can’t have everything. Fall is the time of year that I start thinking of warm spices and bowls of hot soup. And yes I am ready for that to all start. Pumpkin pie has always been one of my favorite pies, but usually, the only time that I get to eat it is on Thanksgiving Day. For some reason, I don’t make a lot of pies; something that I really should change. This baked pumpkin pudding thing all started when I bought a can of pumpkin for something that I had decided to make for my blog, but when I was looking through the recipe I discovered that it was already posted. So I came up with a new plan… baked pumpkin pudding. Super easy to make and so delish! Hope you try it out. In a large mixing bowl whisk together the sugar, eggs, heavy whipping cream, vanilla, and all of the spices. Once this blended together add the pumpkin and whisk until the ingredients are mixed well. Divide into 6 custard cups and place on a baking pan. If you desire to serve with the cinnamon whipped cream here are the instructions to make the whipped cream. In a large bowl add the whipping cream, powdered sugar, and cinnamon, beat unit soft peaks form. Add the vanilla and beat until stiff peaks form. 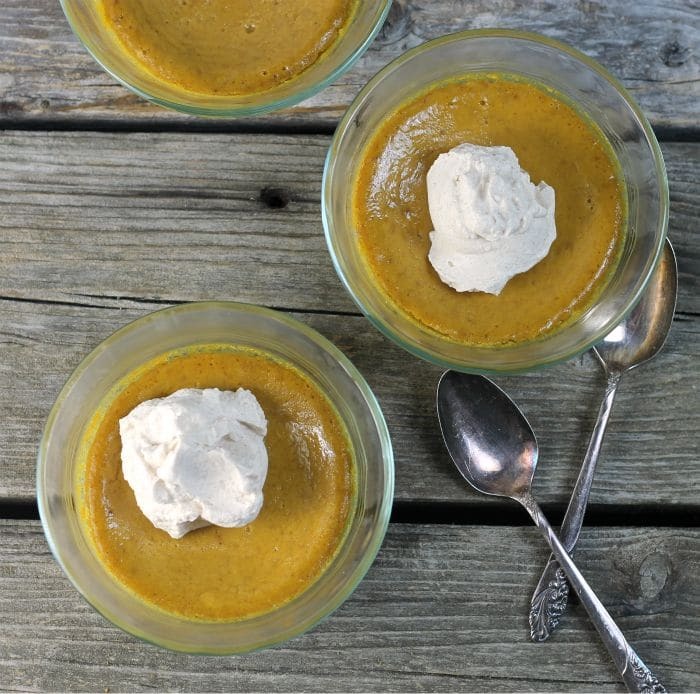 Add a dollop of the cinnamon whipped on top of the cooled baked pumpkin pudding and serve. 15 ounces pumpkin? I guess it’s puree? These days I can’t get enough of pumpkins! The pudding looks fantastic! With ice cream! Delicious! Lovely recipe! This looks wonderful! I don’t like making pie crusts; I love that this is like a crust-less pie! LOL, I often find out I’ve already posted a very similar recipe, too! 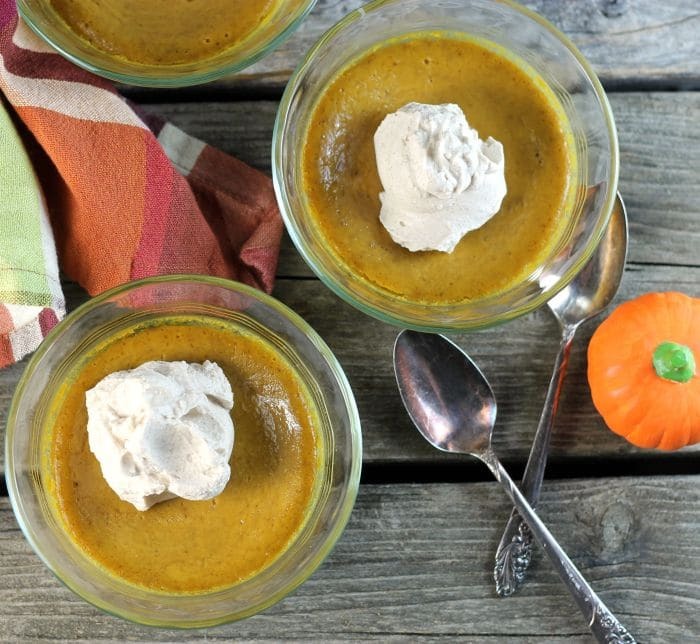 These look like a good excuse to have the yummy flavors of pumpkin pie without all the work! I love this because while I love pumpkin pie, I’m just not a pie crust fan. I always leave it behind and find it unnecessary. 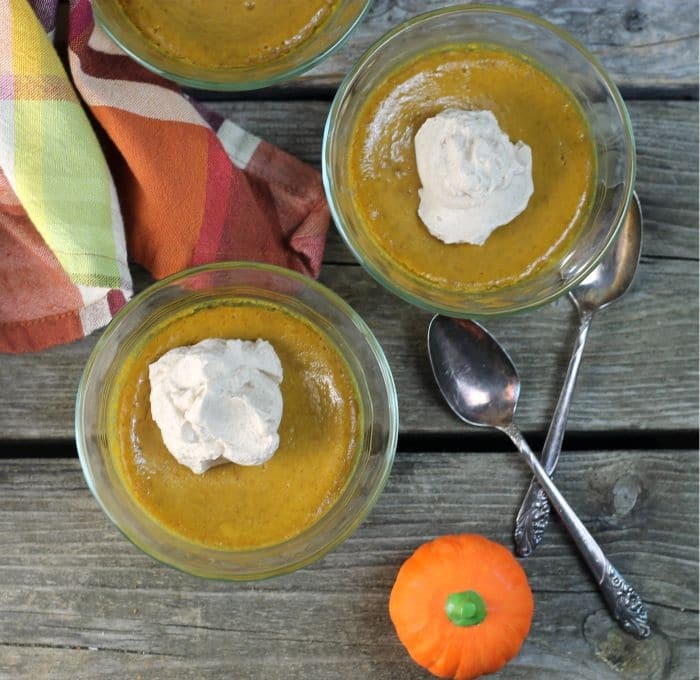 Pumpkin pudding=problem solved! 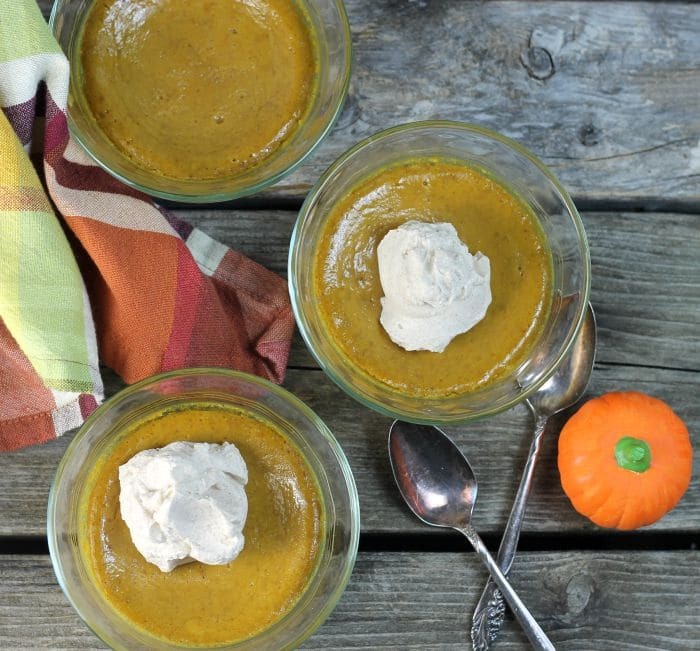 Never thought of making a pumpkin pudding what a great idea. I’ve actually made the same thing twice and almost posted it on my blog, so funny. Love fall too!